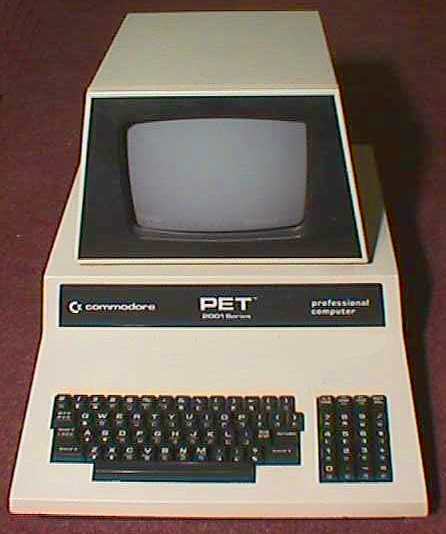 We never owned a Commodore Pet, but my dad would bring it home from work on selective weekends. That made the Commodore Pet the first computer I ever enjoyed. One of my favourite games was Eat-Man. I just Googled the crap out of "Eat-Man" and there's surprisingly nothing out there. Eat-Man was Pac-Man without the high-end graphics. Essentially, the character Eat-Man was the < character and he gobbled up -'s in a Pac-Man like maze. I can't remember what character the ghosts were, but they might have been o's or *'s. Pac-Man was all the rage in the early 80s but I was tearing it up with Eat-Man. Press play on tape one! My old high school had a roomful of these computers. Mostly I can remember that we could write a small instruction file to display wavy repeating keyboard char lines. We used to have PETs at school (The East York board really had a thing for Commodore) and I remember playing this and Lemonade Stand after waiting forever for it to load on tape. Lemonade stand was my other favourite game! A quiz what does P.E.T. stand for? I also remember learning the old languages of BASIC, FORTRAN, COBOL and 6502 ASM. way before University. I totally had to cheat to learn PET stood for Personal Electronic Transactor. Dam you Google or was it Bing? enjoy ... oh to late. One of my first experiences with a floppy drive was with a PET. We had 4032 models, so our drives were externala bout two years after playing Lemonade Stand. I must have been in grade four then, and we loaded Story Writer for word processing from floppy and I seem to remember printing to a networked dot matrix as well. We used to also PEEK and POKE our machines with glee! I can't credit a search engine, it was Wikipedia that coughed up the answer in nanoseconds. I played this also, but the name I remember was "pet-man". I found a few hits on google talking about pet-man but no download links or source code. at the speed it ran I'm guessing it was in BASIC.